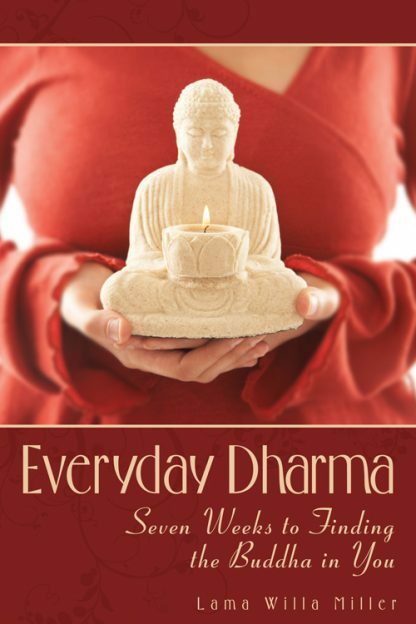 'In The Everyday Dharma, Willa Miller, an authorized lama in the Tibetan Buddhist Tradition, reworks ancient Buddhist techniques and adapts them for western readers seeking personal transformation. Becoming a Buddha, Lama Miller explains, means observing the mind and actions and then doing the physical, psychological, and spiritual work to move closer to one�s wisdom nature. Dharma is spiritual practice; it�s what one does every day to make one�s mind and world a better place to live. Each chapter includes a passage to read, an exercise of the day that relates to each week�s topic, a quote from a sage, and tips on how to make daily practice a little easier. The book shows that it�s not necessary to subscribe to a particular � or any � belief system to benefit from this program. "It�s only necessary," says Lama Miller, "to believe one deserves to live a more fulfilling and meaningful life." Lama Palmo [transitioning to Lama Willa Miller, her American name] has studied and practiced in the Tibetan Buddhist tradition for the last twenty years, and is an authorized lama in the Tibetan Buddhist tradition. Her teachers include the late Venerable Kalu Rinpoche, Venerable Dilgo Khentse Rinpoche, Lama Norlha Rinpoche, Khenpo Tsultrim Gyatso Rinpoche, Bokar Rinpoche, and other teachers from all schools of Tibetan Buddhism. She completed two three-year retreats at Kagyu Thubten Choling Monastery in Wappingers Falls, NY, serving as assistant teacher, retreat master (drupon), and translator for her second retreat. Before and after her retreats, she spent time in Nepal, Tibet, and India, studying Buddhism and engaging in service work. She teaches Tibetan Buddhist practice and meditation in the Northeast. She has an M.A. in Buddhist Studies from the University of Virginia, and is working towards a PhD at Harvard University. She lives in Cambridge, MA with her husband and two dogs.